Continuous Integration is a popular technique in software development. At conferences many developers talk about how they use it, and Continuous Integration tools are common in most development organizations. But we all know that any decent technique needs a certification program — and fortunately one does exist. Developed by one of the foremost experts in continuous delivery and devops, it’s known for being remarkably rapid to administer, yet very insightful for its results. Although it’s quite mature, it isn’t as well known as it should be, so as a fan of the technique I think it’s important for me to share this certification program with my readers. 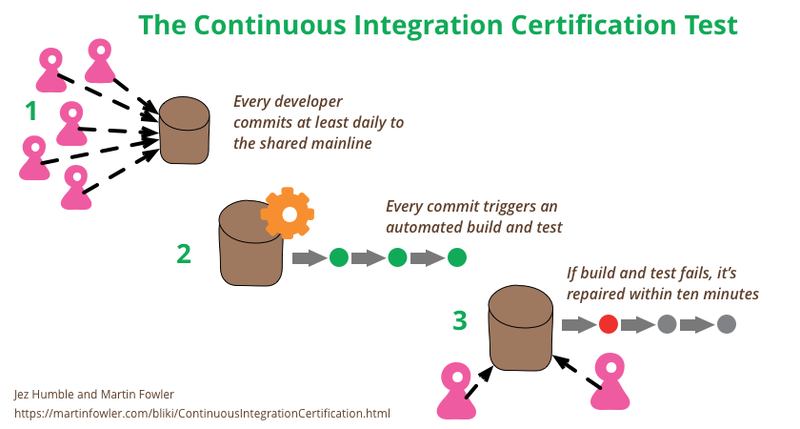 Are you ready to be certified for Continuous Integration? And how will you deal with the shocking truth that taking the test will reveal? By now my regular readers are wondering if they’ve come across a parody post , and yes I am having a little fun with my opening teaser. But like any good joke there’s an important kernel of truth buried in it. There is a remarkably good test for proper Continuous Integration that was created by Jez Humble - and he certainly is a leading expert in ContinuousDelivery. It’s also a rapid test, he often administers it to his audience during his talks. The only problem is that I’ve never heard him refer to it as a certification test - which just shows his lack of vision for money-making schemes. He usually begins the certification process by asking his audience to raise their hands if they do Continuous Integration. Usually most of the audience raise their hands. He then asks them to keep their hands up if everyone on their team commits and pushes to a shared mainline (usually shared master in git) at least daily. Over half the hands go down. He then asks them to keep their hands up if each such commit causes an automated build and test. Half the remaining hands are lowered. With that last question only a few hands remain. Those are the people who pass his certification test. It’s a simple set of questions, but it gets to the core of what Continuous Integration is about. The whole idea is that nobody is working on a code base that deviates significantly from anyone else’s. Continuous Integration means the team knows what the current state of the code truly is, we avoid big risky merges, and people can refactor as much as they need to. The reason so many people raise their hands at the beginning is the common view that Continuous Integration means running some “Continuous Integration Server” against their feature branches. But Continuous Integration — as it was originally described and named by Kent Beck as part of ExtremeProgramming — has nothing to do with tools. At the beginning it was a human workflow and Jim Shore made an excellent argument that it should be that. The idea of running a daemon process against a source code repository came later, and while it is helpful, it’s only Continuous Integration if it’s run on a shared mainline that people commit to every day. Running such a process otherwise, such as on every FeatureBranch, is CI theater that debases the name , yielding a workflow that doesn't give you the benefits that make the whole thing worth the effort. For more details on Continuous Integration, see my main article, while written in 2006 it's still a solid summary and definition of the technique. Jez explains why Continuous Integration is a foundation for Continuous Delivery. He states the three questions in the FAQ on that page. Paul Duvall wrote the definitive book on Continuous Integration. Watch Jez administer the certification test at GOTO Chicago in 2014 (sadly there was no camera on the audience). All credit for the three questions go to Jez, whose talks I've always enjoyed. 2: For this step, "green" counts as passing the commit build, typically compilation and unit tests. While we usually expect a full DeploymentPipeline to be run for release to production, a repository should be fine for developers to work on after the commit build is green. You should have a commit build that takes no more than ten minutes, so quickly fixing it and re-running the commit build works if the fix is easy. If you can't fix and get a green commit build within ten minutes, then you should revert to the last green build. 3: The problem of CI theater leads some people to use the name Trunk-Based Development, arguing that SemanticDiffusion has rendered the term “Continuous Integration” useless. While I understand their view, I believe that we shouldn’t give in to semantic diffusion, instead we need to keep working at re-explaining the proper meaning of Continuous Integration, just as we should with other terms under this kind of semantic assault (such as “agile” and “refactoring”). After all Kent was quite clear in his definition of the term, and using another diminishes the important role he had in popularizing the technique via the Extreme Programming community.